William Blake (28 November 1757–12 August 1827) was an English poet, painter, and printmaker. Largely unrecognised during his lifetime, Blake is now considered a seminal figure in the history of both the poetry and visual arts of the Romantic Age. His prophetic poetry has been said to form "what is in proportion to its merits the least read body of poetry in the English language". His visual artistry has led one British art journalist to proclaim him "far and away the greatest artist Britain has ever produced". Although he only once journeyed farther than a day's walk outside London during his lifetime, he produced a diverse and symbolically rich corpus, which embraced the imagination as "the body of God", or "Human existence itself". Considered mad by contemporaries for his idiosyncratic views, Blake is held in high regard by later critics for his expressiveness and creativity, and for the philosophical and mystical undercurrents within his work. His paintings and poetry have been characterized as part of both the Romantic movement and "Pre-Romantic", for its large appearance in the 18th century. Reverent of the Bible but hostile to the Church of England, Blake was influenced by the ideals and ambitions of the French and American revolutions, as well as by such thinkers as Jakob Böhme and Emanuel Swedenborg. Despite these known influences, the singularity of Blake's work makes him difficult to classify. The 19th century scholar William Rossetti characterised Blake as a "glorious luminary," and as "a man not forestalled by predecessors, nor to be classed with contemporaries, nor to be replaced by known or readily surmisable successors." Historian Peter Marshall has classified Blake as one of the forerunners of modern anarchism, along with Blake's contemporary William Godwin. William Blake was born in 28 Broad Street, London, England on 28 November 1757, to a middle-class family. He was the third of seven children, two of whom died in infancy. Blake's father, James, was a hosier. William never attended school, and was educated at home by his mother Catherine Wright Armitage Blake. The Blakes were Dissenters, and are believed to have belonged to the Moravian Church. The Bible was an early and profound influence on Blake, and would remain a source of inspiration throughout his life. Blake started engraving copies of drawings of Greek antiquities purchased for him by his father, a practice that was then preferred to actual drawing. Within these drawings Blake found his first exposure to classical forms through the work of Raphael, Michelangelo, Marten Heemskerk and Albrecht Dürer. His parents knew enough of his headstrong temperament that he was not sent to school but was instead enrolled in drawing classes. He read avidly on subjects of his own choosing. During this period, Blake was also making explorations into poetry; his early work displays knowledge of Ben Jonson and Edmund Spenser. On 4 August 1772, Blake became apprenticed to engraver James Basire of Great Queen Street, for the term of seven years. At the end of this period, at the age of 21, he was to become a professional engraver. No record survives of any serious disagreement or conflict between the two during the period of Blake's apprenticeship. However, Peter Ackroyd's biography notes that Blake was later to add Basire's name to a list of artistic adversaries—and then cross it out. This aside, Basire's style of engraving was of a kind held to be old-fashioned at the time, and Blake's instruction in this outmoded form may have been detrimental to his acquiring of work or recognition in later life. After two years Basire sent his apprentice to copy images from the Gothic churches in London (it is possible that this task was set in order to break up a quarrel between Blake and James Parker, his fellow apprentice), and his experiences in Westminster Abbey contributed to the formation of his artistic style and ideas; the Abbey of his day was decorated with suits of armour, painted funeral effigies and varicoloured waxworks. Ackroyd notes that "the most immediate [impression] would have been of faded brightness and colour". In the long afternoons Blake spent sketching in the Abbey, he was occasionally interrupted by the boys of Westminster School, one of whom "tormented" Blake so much one afternoon that he knocked the boy off a scaffold to the ground, "upon which he fell with terrific Violence". Blake beheld more visions in the Abbey, of a great procession of monks and priests, while he heard "the chant of plain-song and chorale". On 8 October 1779, Blake became a student at the Royal Academy in Old Somerset House, near the Strand. While the terms of his study required no payment, he was expected to supply his own materials throughout the six-year period. There, he rebelled against what he regarded as the unfinished style of fashionable painters such as Rubens, championed by the school's first president, Joshua Reynolds. Over time, Blake came to detest Reynolds' attitude towards art, especially his pursuit of "general truth" and "general beauty". Reynolds wrote in his Discourses that the "disposition to abstractions, to generalizing and classification, is the great glory of the human mind"; Blake responded, in marginalia to his personal copy, that "To Generalize is to be an Idiot; To Particularize is the Alone Distinction of Merit". Blake also disliked Reynolds' apparent humility, which he held to be a form of hypocrisy. Against Reynolds' fashionable oil painting, Blake preferred the Classical precision of his early influences, Michelangelo and Raphael. Blake's first biographer Alexander Gilchrist records that in June 1780, Blake was walking towards Basire's shop in Great Queen Street when he was swept up by a rampaging mob that stormed Newgate Prison in London. They attacked the prison gates with shovels and pickaxes, set the building ablaze, and released the prisoners inside. Blake was reportedly in the front rank of the mob during this attack. These riots, in response to a parliamentary bill revoking sanctions against Roman Catholicism, later came to be known as the Gordon Riots. They provoked a flurry of legislation from the government of George III, as well as the creation of the first police force. Despite Gilchrist's insistence that Blake was "forced" to accompany the crowd, some biographers have argued that he accompanied it impulsively, or supported it as a revolutionary act. In contrast, Jerome McGann argues that the riots were reactionary, and that events would have provoked "disgust" in Blake. In 1782, Blake met John Flaxman, who was to become his patron, and Catherine Boucher, who was to become his wife. At the time, Blake was recovering from a relationship that had culminated in a refusal of his marriage proposal. He recounted the story of his heartbreak for Catherine and her parents, after which he asked Catherine, "Do you pity me?" When she responded affirmatively, he declared, "Then I love you." Blake married Catherine – who was five years his junior – on 18 August 1782 in St. Mary's Church, Battersea. Illiterate, Catherine signed her wedding contract with an 'X'. The original wedding certificate may still be viewed at the church, where a commemorative stained-glass window was installed between 1976 and 1982. Later, in addition to teaching Catherine to read and write, Blake trained her as an engraver. Throughout his life she would prove an invaluable aid to him, helping to print his illuminated works and maintaining his spirits throughout numerous misfortunes. At this time George Cumberland, one of the founders of the National Gallery, became an admirer of Blake's work. Blake's first collection of poems, Poetical Sketches, was published circa 1783 . After his father's death, William and his brother Robert opened a print shop in 1784, and began working with radical publisher Joseph Johnson. Johnson's house was a meeting-place for some of the leading English intellectual dissidents of the time: theologian and scientist Joseph Priestley, philosopher Richard Price, artist John Henry Fuseli  early feminist Mary Wollstonecraft and American revolutionary Thomas Paine. Along with William Wordsworth and William Godwin, Blake had great hopes for the French and American revolutions and wore a Phrygian cap in solidarity with the French revolutionaries, but despaired with the rise of Robespierre and the Reign of Terror in France. In 1784 Blake also composed his unfinished manuscript An Island in the Moon. Blake illustrated Original Stories from Real Life (1788; 1791) by Mary Wollstonecraft. They seem to have shared some views on sexual equality and the institution of marriage, but there is no evidence proving without doubt that they actually met. In 1793's Visions of the Daughters of Albion, Blake condemned the cruel absurdity of enforced chastity and marriage without love and defended the right of women to complete self-fulfillment. In 1788, at the age of 31, Blake began to experiment with relief etching, a method he would use to produce most of his books, paintings, pamphlets and, of course, his poems, including his longer 'prophecies' and his masterpiece the "Bible." The process is also referred to as illuminated printing, and final products as illuminated books or prints. Illuminated printing involved writing the text of the poems on copper plates with pens and brushes, using an acid-resistant medium. Illustrations could appear alongside words in the manner of earlier illuminated manuscripts. He then etched the plates in acid in order to dissolve away the untreated copper and leave the design standing in relief (hence the name). This is a reversal of the normal method of etching, where the lines of the design are exposed to the acid, and the plate printed by the intaglio method. Relief etching, which Blake invented, later became an important commercial printing method. The pages printed from these plates then had to be hand-coloured in water colours and stitched together to make up a volume. Blake used illuminated printing for most of his well-known works, including Songs of Innocence and Experience, The Book of Thel, The Marriage of Heaven and Hell, and Jerusalem. A study in 2005 of Blake's surviving plates showed that he made frequent use of a technique known as "repoussage" which is a means of obliterating mistakes by hammering them out by hitting the back of the plate. This discovery puts strain on Blake's own assessment of his abilities as well of those of admirers and may also help to explain why some of Blake's work took so long to complete. Blake's marriage to Catherine remained a close and devoted one until his death. Blake taught Catherine to write, and she helped him to colour his printed poems. Gilchrist refers to "stormy times" in the early years of the marriage. Some biographers have suggested that Blake tried to bring a concubine into the marriage bed in accordance with the beliefs of the Swedenborgian Society, but other scholars have dismissed these theories as conjecture. William and Catherine's first daughter and last child might be Thel described in The Book of Thel who was conceived as dead. In 1800, Blake moved to a cottage at Felpham in Sussex (now West Sussex) to take up a job illustrating the works of William Hayley, a minor poet. It was in this cottage that Blake wrote Milton: a Poem (published between 1805 and 1808). The preface to this work includes a poem beginning "And did those feet in ancient time", which became the words for the anthem, "Jerusalem". Over time, Blake came to resent his new patron, coming to believe that Hayley was uninterested in true artistry, and preoccupied with "the meer drudgery of business". Blake's disenchantment with Hayley has been speculated to have influenced Milton: a Poem, in which Blake wrote that "Corporeal Friends are Spiritual Enemies" (3:26). Blake's The Great Red Dragon and the Woman Clothed with Sun (1805) is one of a series of illustrations of Revelation 12. Blake returned to London in 1804 and began to write and illustrate Jerusalem (1804–1820), his most ambitious work. Having conceived the idea of portraying the characters in Chaucer's Canterbury Tales, Blake approached the dealer Robert Cromek, with a view to marketing an engraving. Knowing that Blake was too eccentric to produce a popular work, Cromek promptly commissioned Thomas Stothard, a friend of Blake's, to execute the concept. When Blake learned that he had been cheated, he broke off contact with Stothard. He also set up an independent exhibition in his brother's haberdashery shop at 27 Broad Street in the Soho district of London. The exhibition was designed to market his own version of the Canterbury illustration (titled The Canterbury Pilgrims), along with other works. As a result he wrote his Descriptive Catalogue (1809), which contains what Anthony Blunt has called a "brilliant analysis" of Chaucer. It is regularly anthologised as a classic of Chaucer criticism. It also contained detailed explanations of his other paintings. The exhibition itself, however, was very poorly attended, selling none of the temperas or watercolours. Its only review, in The Examiner, was hostile. He was introduced by George Cumberland to a young artist named John Linnell. Through Linnell he met Samuel Palmer, who belonged to a group of artists who called themselves the Shoreham Ancients. This group shared Blake's rejection of modern trends and his belief in a spiritual and artistic New Age. At the age of 65 Blake began work on illustrations for the Book of Job. These works were later admired by Ruskin, who compared Blake favourably to Rembrandt, and by Vaughan Williams, who based his ballet Job: A Masque for Dancing on a selection of the illustrations. Later in his life Blake began to sell a great number of his works, particularly his Bible illustrations, to Thomas Butts, a patron who saw Blake more as a friend than a man whose work held artistic merit; this was typical of the opinions held of Blake throughout his life. '[T]he Dante watercolours are among Blake's richest achievements, engaging fully with the problem of illustrating a poem of this complexity. The mastery of watercolour has reached an even higher level than before, and is used to extraordinary effect in differentiating the atmosphere of the three states of being in the poem'. Blake's illustrations of the poem are not merely accompanying works, but rather seem to critically revise, or furnish commentary on, certain spiritual or moral aspects of the text. Because the project was never completed, Blake's intent may itself be obscured. Some indicators, however, bolster the impression that Blake's illustrations in their totality would themselves take issue with the text they accompany: In the margin of Homer Bearing the Sword and His Companions, Blake notes, "Every thing in Dantes Comedia shews That for Tyrannical Purposes he has made This World the Foundation of All & the Goddess Nature & not the Holy Ghost." Blake seems to dissent from Dante's admiration of the poetic works of the ancient Greeks, and from the apparent glee with which Dante allots punishments in Hell (as evidenced by the grim humour of the cantos). At the same time, Blake shared Dante's distrust of materialism and the corruptive nature of power, and clearly relished the opportunity to represent the atmosphere and imagery of Dante's work pictorially. Even as he seemed to near death, Blake's central preoccupation was his feverish work on the illustrations to Dante's Inferno; he is said to have spent one of the very last shillings he possessed on a pencil to continue sketching. On her death, Blake's manuscripts were inherited by Frederick Tatham, who burned several of those which he deemed heretical or too politically radical. Tatham had become an Irvingite, one of the many fundamentalist movements of the 19th century, and was severely opposed to any work that "smacked of blasphemy". Sexual imagery in a number of Blake's drawings was also erased by John Linnell. Since 1965, the exact location of William Blake's grave had been lost and forgotten, while gravestones were taken away to create a new lawn. Nowadays, Blake’s grave is commemorated by a stone that reads "Near by lie the remains of the poet-painter William Blake 1757-1827 and his wife Catherine Sophia 1762-1831". This memorial stone is situated approximately 20 metres away from the actual spot of Blake’s grave, which is not marked. However, members of the group Friends of William Blake have rediscovered the location of Blake's grave and intend to place a permanent memorial at the site. Blake is now recognised as a saint in the Ecclesia Gnostica Catholica. The Blake Prize for Religious Art was established in his honour in Australia in 1949. In 1957 a memorial was erected in Westminster Abbey, in memory of him and his wife. Because Blake's later poetry contains a private mythology with complex symbolism, his late work has been less published than his earlier more accessible work. The recent Vintage anthology of Blake edited by Patti Smith focuses heavily on the earlier work, as do many critical studies such as William Blake by D. G. Gillham. The earlier work is primarily rebellious in character, and can be seen as a protestation against dogmatic religion. This is especially notable in The Marriage of Heaven and Hell in which Satan is virtually the hero rebelling against an imposter authoritarian deity. In the later works such as Milton and Jerusalem, Blake carves a distinctive vision of a humanity redeemed by self-sacrifice and forgiveness, while retaining his earlier negative attitude towards the rigid and morbid authoritarianism of traditional religion. Not all readers of Blake agree upon how much continuity exists between Blake's earlier and later works. [T]he promise of the divine in man, made in The Marriage of Heaven and Hell, is at last fulfilled. However, John Middleton Murry notes discontinuity between Marriage and the late works, in that while the early Blake focused on a "sheer negative opposition between Energy and Reason", the later Blake emphasized the notions of self-sacrifice and forgiveness as the road to interior wholeness. This renunciation of the sharper dualism of Marriage of Heaven and Hell is evidenced in particular by the humanization of the character of Urizen in the later works. Middleton characterizes the later Blake as having found "mutual understanding" and "mutual forgiveness". Blake's Ancient of Days. The "Ancient of Days" is described in Chapter 7 of the Book of Daniel. Jesus, for Blake, symbolises the vital relationship and unity between divinity and humanity: "[A]ll had originally one language and one religion: this was the religion of Jesus, the everlasting Gospel. Antiquity preaches the Gospel of Jesus." Blake designed his own mythology, which appears largely in his prophetic books. Within these Blake describes a number of characters, including 'Urizen', 'Enitharmon', 'Bromion' and 'Luvah'. This mythology seems to have a basis in the Bible and in Greek mythology, and it accompanies his ideas about the everlasting Gospel. "I must Create a System, or be enslav'd by another Man's. I will not Reason & Compare; my business is to Create." Words uttered by Los in Blake's Jerusalem: The Emanation of the Giant Albion. “ All Bibles or sacred codes have been the causes of the following Errors. 1. Man has no Body distinct from his Soul for that call'd Body is a portion of Soul discern'd by the five Senses, the chief inlets of Soul in this age. The Body of Abel Found by Adam and Eve, c. 1825. Watercolour on wood. Blake does not subscribe to the notion of a distinct body from the soul, and which must submit to the rule of soul, but rather sees body as an extension of soul derived from the 'discernment' of the senses. Thus, the emphasis orthodoxy places upon the denial of bodily urges is a dualistic error born of misapprehension of the relationship between body and soul; elsewhere, he describes Satan as the 'State of Error', and as being beyond salvation. Plants fruits & beauty there. He did not hold with the doctrine of God as Lord, an entity separate from and superior to mankind; this is shown clearly in his words about Jesus Christ: "He is the only God ... and so am I, and so are you." A telling phrase in The Marriage of Heaven and Hell is "men forgot that All deities reside in the human breast". This is very much in line with his belief in liberty and equality in society and between the sexes. Blake's Newton (1795) demonstrates his opposition to the "single-vision" of scientific materialism: Newton fixes his eye on a compass (recalling Proverbs 8:27, an important passage for Milton) to write upon a scroll which seems to project from his own head. And there behold the Loom of Locke whose Woof rages dire Washd by the Water-wheels of Newton. black the cloth In heavy wreathes folds over every Nation; cruel Works Of many Wheels I view, wheel without wheel, with cogs tyrannic Moving by compulsion each other: not as those in Eden: which Wheel within Wheel in freedom revolve in harmony & peace. Minutest Subdivision[s] Strait or Crooked It is Itself & Not Intermeasurable with or by any Thing Else Such is Job. Despite his opposition to Enlightenment principles, Blake thus arrived at a linear aesthetic that was in many ways more similar to the Neoclassical engravings of John Flaxman than to the works of the Romantics, with whom he is often classified. Therefore Blake has also been viewed as an enlightenment poet and artist, in the sense that he was in accord with that movement's rejection of received ideas, systems, authorities and traditions. On the other hand, he was critical of what he perceived as the elevation of reason to the status of an oppressive authority. In his criticism of reason, law and uniformity Blake has been taken to be opposed to the enlightenment, but it has also been argued that, in a dialectical sense, he used the enlightenment spirit of rejection of external authority to criticize narrow conceptions of the enlightenment. Northrop Frye, commenting on Blake's consistency in strongly held views, notes that Blake "himself says that his notes on [Joshua] Reynolds, written at fifty, are 'exactly Similar' to those on Locke and Bacon, written when he was 'very Young'. Even phrases and lines of verse will reappear as much as forty years later. Consistency in maintaining what he believed to be true was itself one of his leading principles ... Consistency, then, foolish or otherwise, is one of Blake's chief preoccupations, just as 'self-contradiction' is always one of his most contemptuous comments". In one poem, The Book of Thel, Blake questioned the necessity of life which is believed to be an elegy to his dead newborn daughter. Blake retained an active interest in social and political events for all his life, and social and political statements are often present in his mystical symbolism. His views on what he saw as oppression and restriction of rightful freedom extended to the Church. His spiritual beliefs are evidenced in Songs of Experience (1794), in which he distinguishes between the Old Testament God, whose restrictions he rejected, and the New Testament God (Jesus Christ in Trinitarianism), whom he saw as a positive influence. From a young age, William Blake claimed to have seen visions. The first of these visions may have occurred as early as the age of four when, according to one anecdote, the young artist "saw God" when God "put his head to the window", causing Blake to break into screaming. At the age of eight or ten in Peckham Rye, London, Blake claimed to have seen "a tree filled with angels, bright angelic wings bespangling every bough like stars." According to Blake's Victorian biographer Gilchrist, he returned home and reported this vision, and he only escaped being thrashed by his father for telling a lie through the intervention of his mother. Though all evidence suggests that his parents were largely supportive, his mother seems to have been especially so, and several of Blake's early drawings and poems decorated the walls of her chamber. On another occasion, Blake watched haymakers at work, and thought he saw angelic figures walking among them. The Ghost of a Flea, 1819-1820. Having informed painter-astrologer John Varley of his visions of apparitions, Blake was subsequently persuaded to paint one of them. Varley's anecdote of Blake and his vision of the flea's ghost became well-known. [The town of] Felpham is a sweet place for Study, because it is more spiritual than London. Heaven opens here on all sides her golden Gates; her windows are not obstructed by vapours; voices of Celestial inhabitants are more distinctly heard, & their forms more distinctly seen; & my Cottage is also a Shadow of their houses. My Wife & Sister are both well, courting Neptune for an embrace... I am more famed in Heaven for my works than I could well conceive. In my Brain are studies & Chambers filled with books & pictures of old, which I wrote & painted in ages of Eternity before my mortal life; & those works are the delight & Study of Archangels. Now I may say to you, what perhaps I should not dare to say to anyone else: That I can alone carry on my visionary studies in London unannoy'd, & that I may converse with my friends in Eternity, See Visions, Dream Dreams & prophecy & speak Parables unobserv'd & at liberty from the Doubts of other Mortals; perhaps Doubts proceeding from Kindness, but Doubts are always pernicious, Especially when we Doubt our Friends. Error is Created. Truth is Eternal. Error, or Creation, will be Burned up, & then, & not till Then, Truth or Eternity will appear. It is Burnt up the Moment Men cease to behold it. I assert for My Self that I do not behold the outward Creation & that to me it is hindrance & not Action; it is as the Dirt upon my feet, No part of Me. "What," it will be Question'd, "When the Sun rises, do you not see a round disk of fire somewhat like a Guinea?" Oh no, no, I see an Innumerable company of the Heavenly host crying, 'Holy, Holy, Holy, is the Lord God Almighty.' I question not my Corporeal or Vegetative Eye any more than I would Question a Window concerning Sight. I look thro' it & not with it. William Wordsworth remarked, "There was no doubt that this poor man was mad, but there is something in the madness of this man which interests me more than the sanity of Lord Byron and Walter Scott." D.C.Williams (1899–1983) said that Blake was a romantic with a critical view on the world, he maintained that Blake's Songs of Innocence were made as a view of an ideal, somewhat Utopian view whereas he used the Songs of Experience in order to show the suffering and loss posed by the nature of society and the world of his time. Blake's work was neglected for almost a century after his death, but his reputation gained momentum in the 20th century, both from being rehabilitated by critics such as John Middleton Murry and Northrop Frye, but also due to an increasing number of classical composers such as Benjamin Britten and Ralph Vaughan Williams adapting his works. Many such as June Singer have argued that Blake's thoughts on human nature greatly anticipate and parallel the thinking of the psychoanalyst Carl Jung, although Jung dismissed Blake's works as "an artistic production rather than an authentic representation of unconscious processes." Blake had an enormous influence on the beat poets of the 1950s and the counterculture of the 1960s, frequently being cited by such seminal figures as beat poet Allen Ginsberg and songwriter Bob Dylan. Much of the central ideas from Phillip Pullman's famous fantasy trilogy His Dark Materials are rooted in the world of Blake's The Marriage of Heaven and Hell. In wider culture Blake's poetry has been set to music by popular composers. It has been especially popular with musicians since the 1960s. Blake's engravings have also had significant influence on the modern graphic novel. (1987). Narrative Unbound: Re-Visioning William Blake's The Four Zoas. Station Hill Press. ISBN 1886449759. Harold Bloom (1963). Blake’s Apocalypse. Doubleday. (1967). William Blake, 1757–1827; a man without a mask. Haskell House Publishers. G. K. Chesterton (1920s). William Blake. House of Stratus ISBN 0-7551-0032-8. David V. Erdman (1977). Blake: Prophet Against Empire: A Poet's Interpretation of the History of His Own Times. Princeton University Press. ISBN 0-486-26719-9. James King (1991). William Blake: His Life. St. Martin's Press. ISBN 0-312-07572-3. Benjamin Heath Malkin (1806). A Father's Memoirs of his Child. Blake, William, William Blake's Works in Conventional Typography, ed. by G. E. Bentley, Jr., 1984. Facsimile ed., Scholars' Facsimiles & Reprints, ISBN 9780820113883. W.J.T. Mitchell (1978). Blake's Composite Art: A Study of the Illuminated Poetry. Yale University Press. ISBN 0-691-01402-7. Victor N. Paananen (1996). William Blake. Twayne Publishers. ISBN 0-8057-7053-4. George Anthony Rosso Jr. (1993). Blake's Prophetic Workshop: A Study of The Four Zoas. Associated University Presses. ISBN 0-8387-5240-3. A. G. B. Russell (1912). Engravings of William Blake. William Butler Yeats (1903). Ideas of Good and Evil. Contains essays. ^ Frye, Northrop and Denham, Robert D. Collected Works of Northrop Frye. 2006, pp 11-12. ^ Jones, Jonathan (2005-04-25). "Blake's heaven". The Guardian. http://www.guardian.co.uk/arts/critic/feature/0,1169,1469584,00.html. ^ Thomas, Edward. A Literary Pilgrim in England. 1917, p. 3. ^ Yeats, W. B. The Collected Works of W. B. Yeats. 2007, p. 85. ^ Wilson, Mona. The Life of William Blake. The Nonesuch Press, 1927. p.167. ^ The New York Times Guide to Essential Knowledge. 2004, p. 351. ^ Blake, William. Blake's "America, a Prophecy" ; And, "Europe, a Prophecy". 1984, p. 2. ^ Kazin, Alfred (1997). "An Introduction to William Blake". http://www.multimedialibrary.com/Articles/kazin/alfredblake.asp. Retrieved 2006-09-23. ^ Blake, William and Rossetti, William Michael. The Poetical Works of William Blake: Lyrical and Miscellaneous. 1890, p. xi. ^ Blake, William and Rossetti, William Michael. The Poetical Works of William Blake: Lyrical and Miscellaneous. 1890, p. xiii. ^ Marshall, Peter (January 1, 1994). William Blake: Visionary Anarchist (Revised Edition ed.). Freedom Press. ISBN 0900384778. ^ a b c Bentley, Gerald Eades and Bentley Jr., G. William Blake: The Critical Heritage. 1995, page 34-5. ^ a b Raine, Kathleen (1970). World of Art: William Blake. Thames & Hudson. ISBN 0-500-20107-2. ^ Blake, William. The Poems of William Blake. 1893, page xix. ^ Blake, William and Tatham, Frederick. The Letters of William Blake: Together with a Life. 1906, page 7. ^ Erdman, David V. The Complete Poetry and Prose of William Blake (2nd edition ed.). p. 641. ISBN 0-385-15213-2. ^ "St. Mary's Church Parish website". http://home.clara.net/pkennington/VirtualTour/windows_modern.htm#Blake. "St Mary's Modern Stained Glass"
^ Biographies of William Blake and Henry Fuseli, retrieved on May 31st 2007. ^ Kennedy, Mave, Art historian dents image of William Blake, engraver - 2005-4-18. Retrieved 2009-7-6. ^ a b Blake, William. Milton a Poem, and the Final Illuminated Works. 1998, page 14-5. ^ Wright, Thomas. Life of William Blake. 2003, page 131. ^ Lucas, E.V. (1904). Highways and byways in Sussex. Macmillan. ASIN B-0008-5GBS-C.
^ "Friends of Blake homepage". Friends of Blake. http://www.friendsofblake.org/home.htm. Retrieved 2008-07-31. ^ "Coming up - William Blake". BBC Inside Out. 2007-02-09. http://www.bbc.co.uk/insideout/london/series11/week5_healthy_living_working.shtml. Retrieved 2008-08-01. ^ Tate UK. "William Blake's London". http://www.tate.org.uk/learning/learnonline/blakeinteractive/lambeth/london_05.html. Retrieved 2006-08-26. ^ The Unholy Bible, June Singer, p. 229. ^ William Blake, Murry, p. 168. ^ "a personal mythology parallel to the Old Testament and Greek mythology"; Bonnefoy, Yves. Roman and European Mythologies. 1992, page 265. ^ Damon, Samuel Foster (1988). A Blake Dictionary (Revised Edition). Brown University Press. p. 358. ISBN 0874514363. ^ Makdisi, Saree. William Blake and the Impossible History of the 1790s. 2003, page 226-7. ^ Altizer, Thomas J.J. The New Apocalypse: The Radical Christian Vision of William Blake. 2000, page 18. ^ Blake, William. Proverbs of Hell, via The Complete Poetry and Prose of William Blake. 1982, page 35. ^ Blake, Gerald Eades Bentley (1975). William Blake: The Critical Heritage. London: Routledge & K. Paul. p. 30. ISBN 0710082347. ^ Baker-Smith, Dominic. Between Dream and Nature: Essays on Utopia and Dystopia. 1987, page 163. ^ Kaiser, Christopher B. Creational Theology and the History of Physical Science. 1997, page 328. ^ *Ackroyd, Peter (1995). Blake. London: Sinclair-Stevenson. p. 285. ISBN 1-85619-278-4. ^ Essick, Robert N. (1980). William Blake, Printmaker. Princeton, N.J.: Princeton University Press. p. 248. ^ Letter to George Cumberland, 12 April 1827 Complete Works of William Blake Online Blake is referring to his Illustrations of the Book of Job, often considered his artistic masterpiece. ^ Blake, William and Rossetti, William Michael. The Poetical Works of William Blake: Lyrical and Miscellaneous. 1890, page 81-2. ^ a b c Bentley, Gerald Eades and Bentley Jr., G. William Blake: The Critical Heritage. 1995, page 36-7. ^ a b Langridge, Irene. William Blake: A Study of His Life and Art Work. 1904, page 48-9. ^ Blake, William. Complete Writings with Variant Readings. 1969, page 617. ^ John Ezard (2004-07-06). "Blake's vision on show". The Guardian. http://arts.guardian.co.uk/news/story/0,,1254856,00.html#article_continue. Retrieved 2008-03-24. This article incorporates public domain text from : Cousin, John William (1910). A Short Biographical Dictionary of English Literature. London, J. M. Dent & Sons; New York, E. P. Dutton. See Blake's notebook online using the British Library's Turning the Pages system (requires Shockwave). The William Blake Archive, a hypermedia archive sponsored by the Library of Congress and supported by the University of North Carolina at Chapel Hill. William Blake (1757-11-28 – 1827-08-21) was an English poet, painter, printmaker, and essayist. To the Eyes of a Miser a Guinea is more beautiful than the Sun & and a bag worn with the use of Money has more beautiful proportions than a Vine filled with Grapes. The tree which moves some to tears of joy is in the Eyes of others only a Green thing that stands in the way. Some see Nature all Ridicule and Deformity, and by these I shall not regulate my proportions; and some scarce see Nature at all. But to the Eyes of the Man of Imagination, Nature is Imagination itself. As a man is, So he Sees. As the Eye is formed, such are its Powers. Shall never bebeloved by men. Bring me my Spear—O clouds, unfold! Poetry fettered fetters the human race. Nations are destroyed, or flourish, in proportion as their poetry, painting, and music are destroyed or flourish! 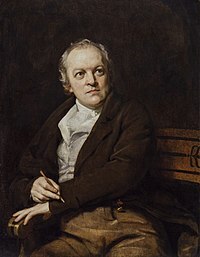 WILLIAM BLAKE (1757-1827), English poet and painter, was born in London, on the 28th of November 1757. His father, James Blake, kept a hosier's shop in Broad Street, Golden Square; and from the scanty education which the young artist received, it may be judged that the circumstances of the family were not very prosperous. For the facts of William Blake's early life the world is indebted to a little book, called A Father's Memoirs on a Child, written by Dr Malkin in 1806. Here we learn that young Blake quickly developed a taste for design, which his father appears to have had sufficient intelligence to recognize and assist by every means in his power. At the age of ten the boy was sent to a drawing school kept by Henry Pars in the Strand, and at the same time he was already cultivating his own taste by constant attendance at the different art sale rooms, where he was known as the "little connoisseur." Here he began to collect prints after Michelangelo, and Raphael, Diirer and Heemskerk, while at the school in the Strand he had the opportunity of drawing from the antique. After four years of this preliminary instruction Blake entered upon another branch of art study. In 1777 he was apprenticed to James Basire, an engraver of repute, and with him he remained seven years. His apprenticeship had an important bearing on Blake's artistic education, and marks the department of art in which he was made technically proficient. In 1778, at the end of his apprenticeship, he proceeded to the school of the Royal Academy, where he continued his early study from the antique, and had for the first time an opportunity of drawing from the living model. This is in brief all that is known of Blake's artistic education. That he ever, at the academy or elsewhere, systematically studied painting we do not know; but that he had already begun the practice of water colour for himself is ascertained. So far, however, the course of his training in art schools, and under Basire, was calculated to render him proficient only as a draughtsman and an engraver. He had learned how to draw, and he had mastered besides the practical difficulties of engraving, and with these qualifications he entered upon his career. In 1780 he exhibited a picture in the Royal Academy Exhibition, conjectured to have been executed in water colours, and he continued to contribute to the annual exhibitions up to the year 1808. In 1782 he married Catherine Boucher, the daughter of a marketgardener at Battersea, with whom he lived always on affectionate terms, and the young couple of ter their marriage established themselves in Green Street, Leicester Fields. Blake had already become acquainted with some of the rising artists of his time, amongst them Stothard, Flaxman and Fuseli, and he now began to see something of literary society. At the house of the Rev. Henry Mathew, in Rathbone Place, he used to recite and sometimes to sing poems of his own composition, and it was through the influence of this gentleman, combined with that of Flaxman, that Blake's first volume of poetry was printed and published in 1783. From this time forward the artist came before the world in a double capacity. By education as well as native talent, he was pledged to the life of a painter, and these Poetical Sketches, though they are often no more than the utterances of a boy, are no less decisive in marking Blake as a future poet. For a while the two gifts are exhibited in association. To the close of his life Blake continued to print and publish, after a manner of his own, the inventions of his verse illustrated by original designs, but there is a certain period in his career when the union of the two gifts is peculiarly close, and when their service to one another is unquestionable. In 1784 Blake, moving from Green Street, set up in company with a fellow-pupil, Parker, as print-seller and engraver next to his father's house in Broad Street, Golden Square, but in 1787 this partnership was severed, and he established an independent business in Poland Street. It was from this house, and in 1787, that the Songs of Innocence were published, a work that must always be remarkable for beauty both of verse and of design, as well as for the singular method by which the two were combined and expressed by the artist. Blake became in fact his own printer and publisher. He engraved upon copper, by a process devised by himself, both the text of his poems and the surrounding decorative design, and to the pages printed from the copper plates an appropriate colouring was afterwards added by hand. The poetic genius already discernible in the first volume of Poetical Sketches is here more decisively expressed, and some of the songs in this volume deserve to take rank with the best things of their kind in our literature. In an age of enfeebled poetic style, when Wordsworth, with more weighty apparatus, had as yet scarcely begun his reform of English versification, Blake, unaided by any contemporary influence, produced a work of fresh and living beauty; and if the Songs of Innocence established Blake's claim to the title of poet, the setting in which they were given to the world proved that he was also something more. For the full development of his artistic powers we have to wait till a later date, but here at least he exhibits a just and original understanding of the sources of decorative beauty. Each page of these poems is a study of design, full of invention, and often wrought with the utmost delicacy of workmanship. The artist retained to the end this feeling for decorative effect; but as time went on, he considerably enlarged the imaginative scope of his work, and decoration then became the condition rather than the aim of his labour. Notwithstanding the distinct and precious qualities of this volume, it attracted but slight attention, a fact perhaps not very wonderful, when the system of publication is taken into account. Blake, however, proceeded with other work of the same kind. The same year he published The Book of Thel, more decidedly mystic in its poetry, but scarcely less beautiful as a piece of illumination; The Marriage of Heaven and Hell followed in 1790; and in 1793 there are added The Gates of Paradise, The Vision of the Daughters of Albion, and some other "Prophetic Books." It becomes abundantly clear on reaching this point in his career that Blake's utterances cannot be judged by ordinary rules. The Songs of Experience, put forth in 1794 as a companion to the earlier Songs of Innocence, are for the most part intelligible and coherent, but in these intervening works of prophecy, as they were called by the author, we get the first public expression of that phase of his character and of his genius upon which a charge of insanity has been founded. The question whether Blake was or was not mad seems likely to remain in dispute, but there can be no doubt whatever that he was at different periods of his life under the influence of illusions for which there are no outward facts to account, and that much of what he wrote is so far wanting in the quality of sanity as to be without a logical coherence. On the other hand, it is equally clear that no madness imputed to Blake could equal that which would be involved in the rejection of his work on this ground. The greatness of Blake's mind is even better established than its frailty, and in considering the work that he has left we must remember that it is by the sublimity of his genius, and not by any mental defect, that he is most clearly distinguished from his fellows. With the publication of the Songs of Experience Blake's poetic career, so far at least as ordinary readers are concerned, may be said to close. A writer of prophecy he continued for many years, but the works by which he is best known in poetry are those earlier and simpler efforts, supplemented by a few pieces taken from various sources, some of which were of later production. But although Blake the poet ceases in a general sense at this date, Blake the artist is only just entering upon his career. In the Songs of Innocence and Experience, and even in some of the earlier Books of Prophecy, the two gifts worked together in perfect balance and harmony; but at this point the supremacy of the artistic faculty asserts itself, and for the remainder of his life Blake was pre-eminently a designer and engraver. The labour of poetical composition continues, but the product passes beyond the range of general comprehension; while, with apparent inconsistency, the work of the artist gains steadily in strength and coherence, and never to the last loses its hold upon the understanding. It may almost be said without exaggeration that his earliest poetic work, The Songs of Innocence, and nearly his latest effort in design, the illustrations to The Book of Job, take rank among the sanest and most admirable products of his genius. Nor is the fact, astonishing enough at first sight, quite beyond a possible explanation. As Blake advanced in his poetic career, he was gradually hindered and finally overpowered by a tendency that was most serviceable to him in design. His inclination to substitute a symbol for a conception, to make an image do duty for an idea, became an insuperable obstacle to literary success. He endeavoured constantly to treat the intellectual material of verse as if it could be moulded into sensuous form, with the inevitable result that as the ideas to be expressed advanced in complexity and depth of meaning, his poetic gifts became gradually more inadequate to the task of interpretation. The earlier poems dealing with simpler themes, and put forward at a time when the bent of the artist's mind was not strictly determined, do not suffer from this difficulty; the symbolism then only enriches an idea of no intellectual intricacy; but when Blake began to concern himself with profounder problems the want of a more logical understanding of language made itself strikingly apparent. If his ways of thought and modes of workmanship had not been developed with an intensity almost morbid, he would probably have been able to distinguish and keep separate the double functions of art and literature. As it is, however, he remains as an extreme illustration of the ascendancy of the artistic faculty. For this tendency to translate ideas into image, and to find for every thought, however simple or sublime, a precise and sensuous form, is of the essence of pure artistic invention. If this be accepted as the dominant bent of Blake's genius, it is not so wonderful that his work in art should have strengthened in proportion as his poetic powers waned; but whether the explanation satisfies all the requirements of the case or not, the fact remains, and cannot be overlooked by any student of Blake's career. In 1796 Blake was actively employed in the work of illustration. Edwards, a bookseller of New Bond Street, projected a new edition of Young's Night Thoughts, and Blake was chosen to illustrate the work. It was to have been issued in parts, but for some reason not very clear the enterprise failed, and only a first part, including forty-three designs, was given to the world. These designs were engraved by Blake himself, and they are interesting not only for their own merit but for the peculiar system by which the illustration has been associated with the text. It was afterwards discovered that the artist had executed original designs in water-colour for the whole series, and these drawings, 537 in number, form one of the most interesting records of Blake's genius. Gilchrist, the painter's biographer, in commenting upon the engraved plates, regrets the absence of colour, "the use of which Blake so well understood, to relieve his simple design and give it significance," and an examination of the original water-colour drawings fully supports the justice of his criticism. Soon after the publication of this work Blake was introduced by Flaxman to the poet Hayley, and in the year 180r he accepted the suggestion of the latter, that he should take up his residence at Felpham in Sussex. The mild and amiable poet had planned to write a life of Cowper, and for the illustration of this and other works he sought Blake's help and companionship. The residence at Felpham continued for three years, partly pleasant and partly irksome to Blake, but apparently not very profitable to the progress of his art. One of the annoyances of his stay was a malicious prosecution for treason set on foot by a common soldier whom Blake had summarily ejected from his garden; but a more serious drawback was the increasing irritation which the painter seems to have experienced from association with Hayley. In 1804 Blake returned to London, to take up his residence in South Moulton Street, and as the fruit of his residence in Felpham, he published, in the manner already described, the prophetic books called the Jerusalem, The Emanation of the Giant Albion, and Milton. The first of these is a very notable performance in regard to artistic invention. Many of the designs stand out from the text in complete independence, and are now and then of the very finest quality. In the years1804-1805Blake executed a series of designs in illustration of Robert Blair's The Grave, of much beauty and grandeur, though showing stronger traces of imitation of Italian art than any earlier production. These designs were purchased from the artist by an adventurous and unscrupulous publisher, Cromek, for the paltry sum of X 2 1, and afterwards published in a series of engravings by Schiavonetti. Despite the ill treatment Blake received in the matter, and the other evils, including a quarrel with his friend Stothard as to priority of invention of a design illustrating the Canterbury Pilgrims, which his association with Cromek involved, the book gained for him a larger amount of popularity than he at any other time secured. Stothard's picture of the Canterbury Pilgrims was exhibited in 1807, and in 1809 Blake, in emulation of his rival's success, having himself painted in water-colour a picture of the same subject, opened an exhibition, and drew up a Descriptive Catalogue, curious and interesting, and containing a very valuable criticism of Chaucer. The remainder of the artist's life is not outwardly eventful. In 1813 he formed, through the introduction of George Cumberland of Bristol, a valuable friendship with John Linnell and other rising water-colour painters. Amongst the group Blake seems to have found special sympathy in the society of John Varley, who, himself addicted to astrology, encouraged Blake to cultivate his gift of inspired vision; and it is probably to this influence that we are indebted for several curious drawings made from visions, especially the celebrated "ghost of a flea" and the very humorous portrait of the builder of the Pyramids. In 1821 Blake removed to Fountain Court, in the Strand, where he died on the 12th of August 1827. The chief work of these last years was the splendid series of engraved designs in illustration of the book of Job. Here we find the highest imaginative qualities of Blake's art united to the technical means of expression which he best understood. Both the invention and the engraving are in all ways remarkable, and the series may fairly be cited in support of a very high estimate of his genius. None of his works is without the trace of that peculiar artistic instinct and power which seizes the pictorial element of ideas, simple or sublime, and translates them into the appropriate language of sense; but here the double faculty finds the happiest exercise. The grandeur of the theme is duly reflected in the simple and sublime images of the artist's design, and in the presence of these plates we are made to feel the power of the artist over the expressional resources of human form, as well as his sympathy with the imaginative significance of his subject. William Blake (November 28 1757 – August 12 1827) was an English poet, visionary, painter, and printmaker. During his lifetime he was not very well known. Today Blake's work is thought to be important in the history of both poetry and the visual arts. His most famous poem is "And did those feet in ancient time" which, more than 100 years later, was put to music by Hubert Parry. The hymn is called "Jerusalem". Blake was voted 38th in a poll of the 100 Greatest Britons organized by the BBC in 2002. Recent Discovery of the Location of William Blake's Grave. A reference on Blake's works. British Library Podcast Tracy Chevalier reads from her novel Burning Bright and discusses William Blake's Notebook with Blake scholar Michael Phillips. Poems by William Blake at PoetryFoundation.org - William Blake : The Poetry Foundation : Find Poems and Poets. Discover Poetry. A reference on Blake's works. - David Whitmarsh: William Blake's 'The Four Zoas' & 'Jerusalem' Explained: Blake's meaning, myth and symbol.